Only with public support will our annual monarch migrations continue for many years. News headlines often bear a second look. And this week’s “good news” about monarch butterflies is no exception. News sources this week are reporting that monarch butterfly colonies covered almost 15 acres of Mexican mountainside in 2019, a 144% increase from last winter. 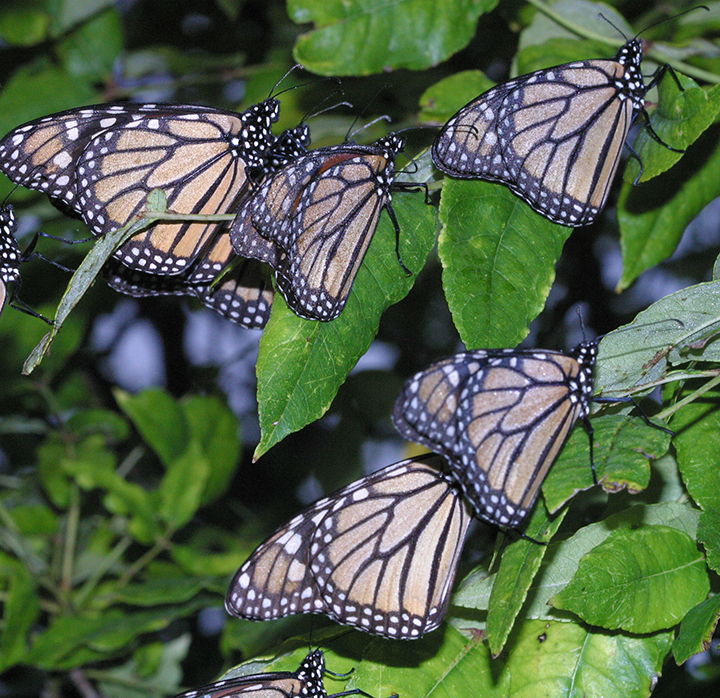 Colony sizes are based on estimates of the total acreage of trees covered with monarchs in the Monarch Butterfly Biosphere Reserve in Mexico–the main overwintering site for eastern monarch butterflies. Acreage estimates provide an index as to how many butterflies survived the previous year’s migration, and how many butterflies will be ready to make the journey north in the spring. While certainly good news, these gains do not mean monarch butterflies are out of the woods (no pun intended). Consider the historical data on monarch colony size fluctuations. 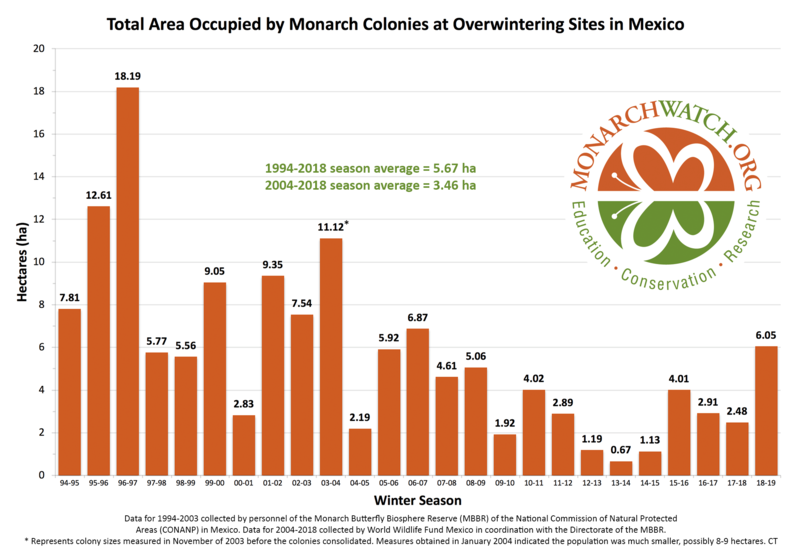 According to the group Monarch Watch, between 1994 and 2004 the average overwintering colony size was about 22 acres (equivalent to the size of 7 football fields). Between 2004 and 2018 the average overwintering colony was about 8.5 acres (2.5 football fields). The lowest year on record occurred in 2014 with colony size shrinking to only 1.5 acres (1+ football field). These areas may still sound relatively big, but these sites represent all monarchs in the eastern U.S. Loss of even part of this habitat due to development or logging could affect monarch butterflies over half the country. What a shame it would be for our next generations to not know the beauty of monarch butterflies. A separate monarch population blesses the western states. West of the Rocky Mountains all monarchs migrate to protected sites among the hills and redwoods of the California coast. Western monarchs may be even more at-risk than their eastern cousins. One study predicted a 70% chance that these west coast monarchs will go extinct within the next 20 years. Average winter abundance during the 2000s is only 5% of what is was in the 1980s. We can all pitch in to save these fascinating insects. Consider planting milkweeds and other nectar producing flowers in your gardens this year. Milkweeds provide a food source for monarch caterpillars. Other flowers provide nectar for the adults. Together such gardens can help make up for all the land being converted to concrete and houses. Learn more about what you can do at Monarch Joint Venture. And if you golf, or know someone who works in the golf course industry, tell them about the Monarchs in the Rough campaign to donate enough seeds to plant one acre patches of milkweed in golf courses around the country. Just as little things, like butterflies, can make a big difference in our lives, your concern can make a big difference in the future of the monarch. This entry was posted in Interesting insects, News and tagged conservation, extinction, Mexico, migration, Monarch buttterfly, Texas. Bookmark the permalink.